Depending on their color and pattern, Granada Tile’s cement tile designs can fit style sensibilities ranging from the bohemian to the traditional, from modern to elegant. Granada Tile’s Normandy cement tile pattern definitely falls into this last category. With its quatrefoil shape suggestive of Gothic design, Normandy concrete tile has a great traditional feel but, because it’s been pared down to its essential elements, this encaustic tile also feels very modern, making it a great choice for a contemporary space. 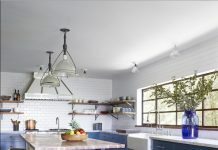 And, in the subtle pairing of pale grey and white, in stock colors which are available in our cement tile web store, these cement tiles wash a space with quiet elegance. In this bathroom renovation, the idea was to stay true to the Arcadia, California home’s original Spanish Mission vibe. Because of their matte finish, making them non-slip even when wet, extending these concrete tiles into the shower floor as floor tile extends the bathroom. As designer Jaimee Rose points out, “Any time you can extend the bathroom floor tile into the shower, you make your bathroom look that much bigger.” Keeping things simple, Rose chose a simple cream bathroom wall tile, letting the Normandy concrete shower floor tile be the star. 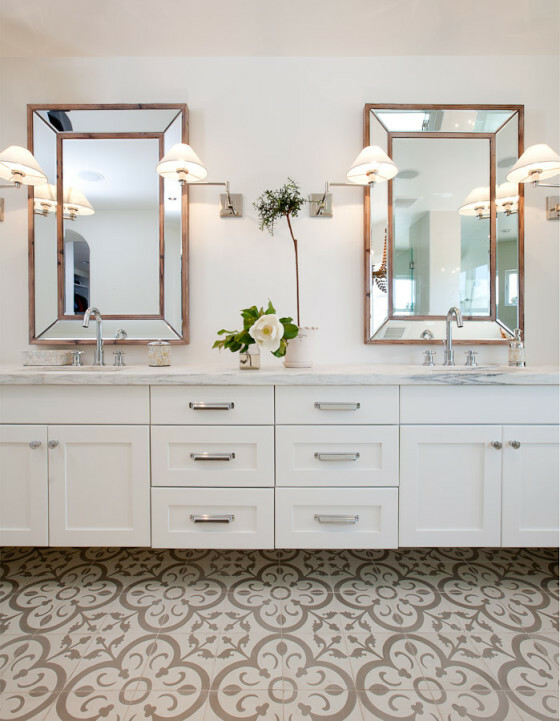 Vintage touches like the mirrors and a fabulous Empire-style chandelier pick up the Normandy cement tiles’ antique qualities while simple white Shaker-style cabinetry brings out its more modern side. 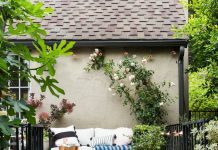 For more about this renovation including the before, check out interior designer Jaimee Rose’s full piece on her blog. The qualities that make Granada Tile’s cement tiles perfect for a hardworking coffee shop floor tile or restaurant tile floor — in addition to their beautiful designs and vivid colors, our concrete tile is long lasting, easy care, low maintenance and less apt to be slippery when wet — are the same ones that make it perfect for your home, whether used as bathroom floor tile, shower wall tile, kitchen tile backsplash, kitchen tile floor, patio tile floor or fireplace tile surround. 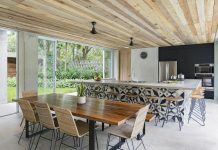 Start by visiting our cement tile web store to peruse our large selection of in-stock handmade master-crafted cement tiles and call us today at 213-482-8070 to discuss which of our encaustic tiles would be perfect for your home or restaurant project.